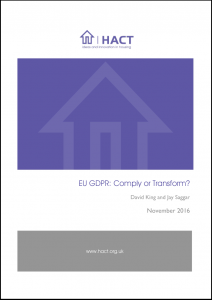 EU GDPR: Comply or Transform? Over the last year housing providers have begun to look seriously at the potential for digital to cut costs and improve services. In particular, if a shift to digital could unlock self-service, then the business model of housing providers could be completely transformed. From the residents perspective, self-service could be viewed positively, boosting convenience and control, as with Uber, or negatively, as a shifting of labour costs, as with supermarket checkouts. That’s not to mention how digital services are vulnerable to new risks, like data being stolen. In response to these new threats, the EU has created a new piece of regulation, the GDPR. Our new briefing paper captures some of our initial thoughts on how this regulation might impact housing providers, assisted by our project partners TLT solicitors, Hatdex and Projects by If. Critically, this new regulation should not be seen as an annoying barrier to digitalisation. Instead, GDPR should be used to guide service re-design around the resident.